Mitsubishi says their new all electric i is "the most likeable car on the planet", I say it's in a class by itself. If you are wondering if an electric car might be right for you, but you are feeling just a tad bit overwhelmed by all of the green car choices out there, I think I can help you sort through some of the confusion. You see electric cars don't have to be expensive, difficult to operate or so small that you feel like you should be wearing a big red nose and a clown costume. In fact, in comparison to all of the green cars available on the market (including the Nissan Leaf), the Mitsubishi i is not only the least expensive electric ride but it is, in my opinion, in a class by itself when it comes to ease of use and efficiency. But you don't have to just take my word for it, you can find out for yourself what makes the i the leader in electric car technology during the Mitsubishi i 100% Electric Car Experience Tour. 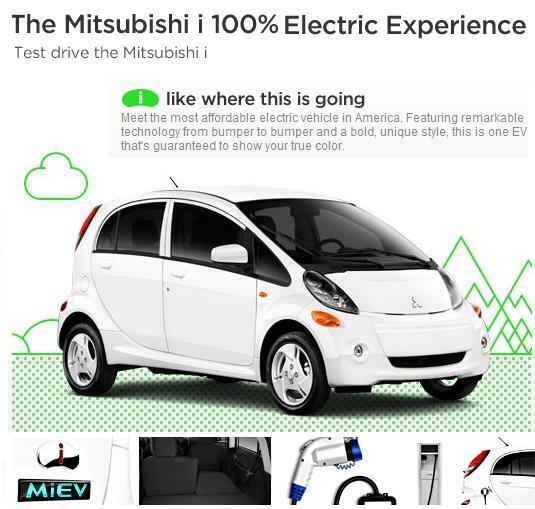 The folks at Mitsubishi worked for four decades perfecting their Mitsubishi innovative Electric Vehicle (MiEV) technology - so I can see why they just couldn't wait until the i is available for sale in early 2012 to get you behind the wheel! The Mitsubishi i 100% Electric Experience Tour is your opportunity to experience MiEV technology firsthand and test drive the new 100% Electric Mitsubishi before it heads to dealers for sale. Mitsubishi will even have their experts on hand at tour events to answer any questions you night have about owning an electric car. The 2012 Mitsubishi i has already been a big hit on the green carpet at Portland Fashion Week and at the Carmel Arts and Film Festival in California. There is still time for you to get behind the wheel of the Mitsubishi i in your city during the 100% Electric Experience Tour. New locations are still being added to the tour so be sure to check out the Mitsubishi i Facebook Fanpage ( https://www.facebook.com/iMitsubishi) to see where the tour will be heading next. Warning! I kind of got sidetracked when I landed on the Mitsubishi i Fanpage on Facebook because they have some pretty cool apps. You should totally check out their page and use the Savings Calculator to find out how much gas money you would save driving the Mitsubishi i or click on Good Clean Fun to take an interactive quiz to see how much you really know about electric cars. For example, do you know that the Mitsubishi i doesn't even have a tailpipe? The internal combustion gasoline engine has been totally replaced with a clean, efficient electric motor and a high-tech drive train that produces zero on-road emissions creating a healthier planet for us all. Powered by the Mitsubishi innovative Electric Vehicle (MiEV) technology, the i has a smooth ride and top speed of approximately 80 mph with a range of 62 miles per charge. The MiEV technology is the central operating system for the i which constantly monitors and optimizes the flow of energy throughout the car. The result is an electric car that easily provides the type of performance and economy you want from a green ride - but don't always get. MiEV technology creates smooth and constant acceleration, distributes incoming energy from the regenerative brakes and it continually regulates the output from the battery. 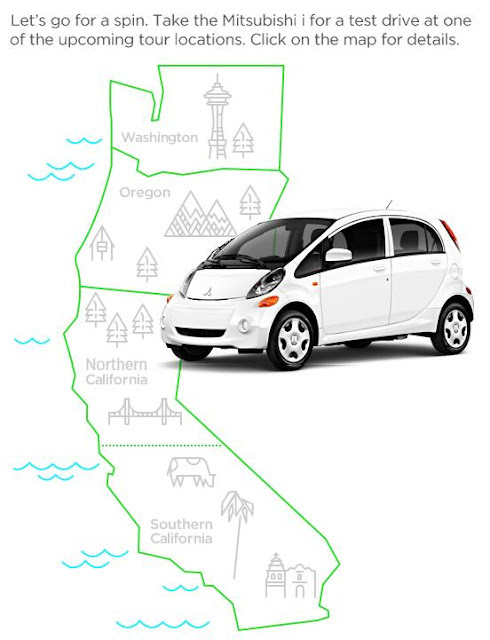 The MiEV is kind of an automatic copilot that easily ensures all systems are, well, green. So the new i is easy to use and efficient. Great. But what about size? Well, the 2012 Mitsubishi i might look compact but it is optimally designed for comfort. You don't think the engineers at Mitsubishi would work for four decades perfecting the MiEV and then forget about comfort do you? They made sure there is ample legroom and headroom in the front as well as the back. When you head out for your test drive you will see that the Mitsubshi i easily accommodates 4 adult passengers. Mitsubishi anticipates an initial rollout of their game-changing EV (that's car talk for Electric Vehicle) into its dealerships in California, Oregon, Washington and Hawaii by November 2011, followed by the northeastern U.S. market by March 2012. Nationwide availability is expected by December 2012. But don't wait until the mad rush ensues when the green living Mitsubishi i goes on sale, if you are one of the lucky ones who live in the Pacific Northwest or California, make a date to see if this electric, green ride is a perfect fit for your lifestyle. You just might find the new 2012 Mitsubishi i is everything you are looking for and more.